Once again it is time to bring you all up to date on the latest from the Taricaya Research Center and, as usual, the problem is knowing where to start. Firstly I would like to report that we have had our 100th booking for 2007 and so we are on track to reaching our highest numbers in any given year since the center’s conception in 2001. The large volume of volunteers is hugely satisfying as it means we can press on with our work and can advance in leaps and bounds. There is never a shortage of things to be done and new projects to initiate so I am very pleased that we continue to push forward full throttle. The continued high numbers has meant that we have been able to work on many projects in parallel again this month and there have been some great results from our three data collection studies: herpetology walks, butterfly traps and mist netting. 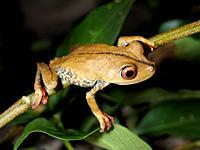 The herpetology database for the reserve is constantly increasing and we are updating our species list every month. A nocturnal frog hunt bore very fruitful as we split up and headed to the ever retreating swamps left around the reserve. As the dry season tightens its grip the depressions that traverse the reserve are losing their water and the once neck-high swamps are ever dwindling. Now the swamps are much smaller and shallower and the presence of smallish (!) black caiman in the depressions along the eastern limits of the reserve did not prevent volunteers helping us collect many specimens including a couple of new species of tree frog for our database. The river is also dropping as the rains stay away and it was with a tinge of regret that I took volunteers on the last caiman hunt until the rains return. The low water level makes driving at night dangerous with many hidden beaches and logs so we headed out for the last search of the season. Little did I know that my run of great findings on such excursions was to continue with yet another great capture. 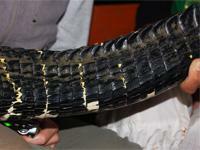 What appeared to be a regular capture of a black caiman shocked me for two reasons. 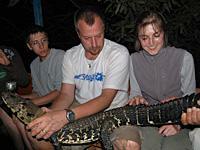 Firstly I misjudged the size of the animal as a branch was partly covering its head, the caiman put up a fierce struggle and when I finally managed to lift it out of the water I was confronted by a 1.5m monster not the smaller individual I had expected. Then I was struck by how dark the skin was, black caimans are recognised by their dark stripes on a lighter skin but this male was almost completely black with only occasional pale markings. Back at the lodge I looked up references for this rare colouration and found that occasionally black caimans produce large quantities of melanin (dark skin pigment) that result in this rare appearance. So the caiman hunts finished on a high and we wait for the river to rise again later this year to continue investigating the crocodilians of Taricaya. The butterfly traps have now been raised to a higher level in the canopy and whilst we seem to have fewer captures at this elevation we continue to capture new species for the reserve and after just a month of investigating we have 103 species of butterfly on record at Taricaya. This number will only continue to increase as we vary trap locations within the reserve utilising different types of forest and different levels within the canopy. These combinations coupled with the seasonality of some butterfly species will mean that the numbers will increase steadily throughout the first year of the study before starting to level off as we have found with the bird species of Taricaya. This brings me neatly to the mist netting that I have started up again as a result of the conference in Venezuela last month. During the initial study of bird diversity around the reserve Mauricio and I ringed all the birds we captured and created a photographic catalogue for over 520 individuals. Now with two years past since our nets were first strung up I wanted to see how these birds have fared and whether they have actively moved around the reserve. To do this the nets needed to be placed in the same locations and recapture rates investigated. This basically involves looking for birds with rings to be captured again so we can see if they have migrated locally from other parts of the reserve or whether they have stayed in the same territory for the last two years. I was excited by the prospects of what I might find and accompanied by volunteers keen to learn we set up the nets in identical fashion to 2005. The only difference in this year’s investigation is that the nets were to be used for just three days not five as the capture rate drops significantly after the third day as birds learn to avoid the nets and with so much else going on around the reserve five days seemed too long. The first two transects have now been completed and there are some very interesting findings: firstly, capture rates seem to be consistently lower than two years ago and I can only speculate as to why. My initial reaction involves the weather as this dry season is incredibly hot and I recall two years ago the presence of many friajes (cold weather spells) that would have forced the birds to actively search for more food to avoid starvation due to heat loss. This increased activity would mean there was a greater chance that the wandering birds would fly into the nets. A second factor could be that we are starting earlier in the year than in 2005. Just a month’s head-start could affect the results as there is still plenty of water present around the reserve and our two initial transects are not located near these temporary swamps where food might still be more abundant than elsewhere in the reserve. Either way the results themselves are very interesting and cause us to consider even more factors that might have influenced the initial findings and now these, our latest results. Nonetheless there were several recaptures of many species from wood-creepers to ant-birds and this is encouraging as our novel ringing technique has obviously not harmed the survival chances of the captured individuals. Secondly, for some of the smaller, food-specific species to have survived two years suggests a stable ecosystem with sufficient food available. July will see us take a break from the mist netting as the two week specials kick in and the turtle project will also occupy a lot of our time. 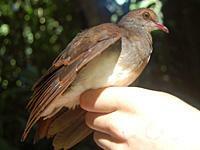 But I would be remiss not to mention a great capture on the final day of the first transect as we caught a new species for the reserve, the Violaceous quail-dove (Geotrygon violacea). The list slowly increases and the sighting of a Purus (chestnut) jacamar (Galbalcyrhynchus purusianus) from New Farm Platform gave us another new species to add to the list. On a slight aside Fernando and I received a request from the head of the local council for aid in clearing and rebuilding a damaged lookout area above Puerto Capitania in Puerto Maldonado. The area had become very overgrown and a site for some of the towns more unsavoury characters to loiter in the evenings and when we presented the request to the volunteers I was not in the bit surprised that they offered to give up their free time on a Saturday afternoon. Thus armed with machetes, paint, hammer and nails the whole group got to work and after just two Saturdays the area was restored to its former glory. Whilst this is not directly a conservation related activity it is very pleasing that we, at Taricaya, are recognised as an institution dedicated to helping others and that prominent figures in the area seek our help. As our reputation grows in our chosen field such good publicity cannot be sneezed at and once again our big-hearted volunteers gave more than could have been expected by sacrificing their day off two weeks in a row! Well I shall wrap up this report and July will see the start of the turtle project, another trip to Tambopata and much more…..